Two radar units are said to be Fourier compatible if and only if a continuous wave train emitted by one radar unit produces a return signal which has a sharp Fourier spectrum at the second radar unit. If the return signal is not spectrally sharp (within prespecified bounds), then the two units are said to be Fourier incompatible. 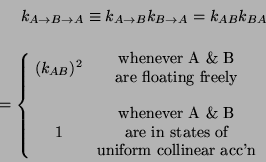 The numbers and are, of course, the familiar Doppler frequency shift factors if A and B are freely floating units, and the pseudo-gravitational frequency shift factors if A and B are uniformly and collinearly accelerated units. For the former one has , while for the latter one has . For example, it is clear that all freely floating (``inertial'') units are Fourier compatible. So are the units which are linearly and uniformly accelerated and have the same future and past event horizons. However, an accelerated unit and one in a state of free float are not Fourier compatible. Neither are two units if one of them undergoes non-uniform acceleration. Such units measure a Doppler chirp instead of a constant Doppler shift when they receive the wave train reflected by the other.